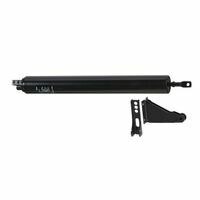 Kit is designed to replace damaged door closer brackets. Kit contains: 1-Jamb bracket, 1-Door bracket, 4-Long screws, 4-short screws, and 2-attachment pins. Door closer NOT included. Visual-pack. For lightweight storm doors and wood doors. Full 90 degree opening. Two hole end plug for summer or winter. Adjustable latching power and closing speed. Factory lubricated. Visual pack.